Hiya guys! 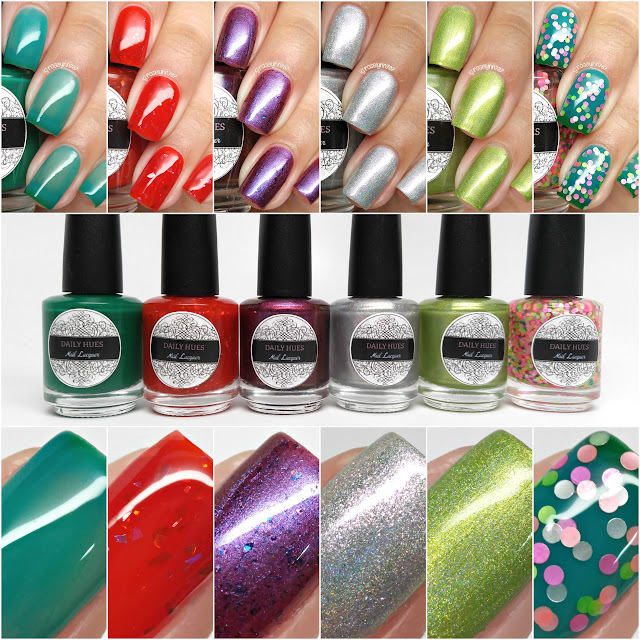 Today I'm sharing swatches for Part 1 of the Summer in Seattle Collection Part 1 by Daily Hues Lacquer. Taking inspiration from the city of Seattle Washington, Jenn has created one huge collection just in time for summer. Part 1 is all inspired by Places to See while part 2 is inspired by Things to Do. That half of the collection will be released in early July and I'll have swatches for you soon. But for now let's get to the first half! The Summer in Seattle Collection Part 1 by Daily Hues Lacquer is now available for purchase. Each full-size polish will retail between $8.50 to $10.50. The entire collection is also available to purchase for $51. It's a Siren, Not a Mermaid can be described as a Starbucks colored green thermal. If you know anything about me, then you know how much I adore my thermals. I know they aren't for everyone, but one inspired by Starbucks is irresistible to me. The formula applies a bit on the sheer side, so you can see my nail line. A third coat would of probably covered that completely. Shown here in two coats and sealed with a glossy topcoat. It's Pike Not Pikes can be described as a bright red jelly with holo flakes. Inspired by the awesome Seattle open air market – Pike Place Market. 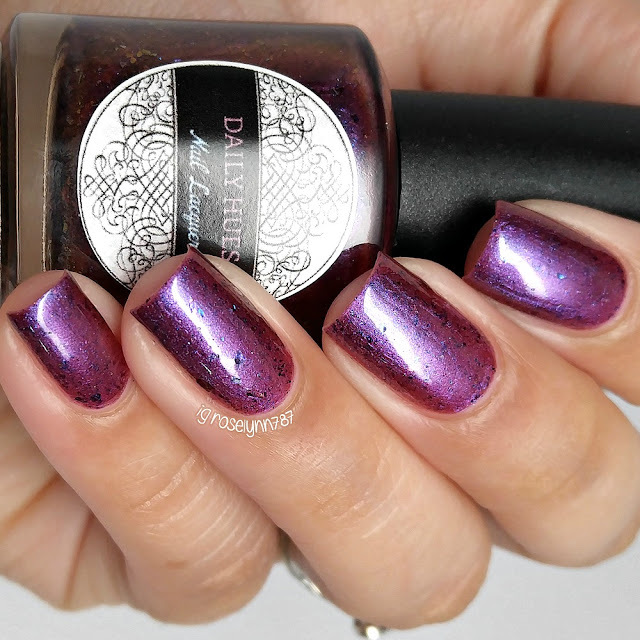 Brace yourself because... this is actually the first jelly polish ever from Daily Hues! And it's an absolute beauty, I mean look at that squishy finish. The formula has a good consistency, which makes the layering a breeze. It builds up really opaque and as you can see in these photos my nail line isn't visible at all. Shown here in three coats and sealed with a glossy topcoat. Smashed Guitar can be described as a purple duo-chrome with hints of orange and red, as well as purple/orange UCC flakies. Inspired by the Experience Music Project (EMP) building, the architect has said that it is supposed to look like a smashed/broken guitar. One of my favorites and also my pick for must-have from this collection. The flakies look so good in contrast with the duo-chrome shift. The formula has a great smooth application with fantastic flakie distribution in each brush stroke. Shown here in three coats and sealed with a glossy topcoat. 1962 Worlds Fair can be described as a full coverage linear holo with pink flashes. Inspired by the Worlds Fair that occurred in Seattle and the thereafter Space Needle. Photos do this one no justice I tell you. Another pick of mine for must-have from this collection without a doubt. Expect this beauty to make a frequent appearance as it's a quick favorite base for nail art. The formula has a smooth and easy application with no hiccups. I could have honestly got away with just two coats, but I decided to add a thin third for good measure. Shown here in two-three coats and sealed with a glossy topcoat. Zeniful can be described as a lime green linear holo. Inspired by the beautiful Japanese garden in the Arboretum of Madison Park. If you're a huge fan of green, then this beauty should be right up your alley. Like with the other holo, photos for this polish were taken in lightbox so it does the holographic finish no justice. Similar application and formula to that of 1962 Worlds Fair. Shown here in two coats and sealed with a glossy topcoat. ABC (Already Been Chewed) can be described as a clear-based glitter bomb full of neon dots. ABC is inspired by the Gum Wall located in Post Alley. It was actually cleaned for the first time in 20 years and is being rebuilt now. I cannot help but giggle so much at the name of this cutey, it brings back so many childhood memories of silly kid shenanigans. I think this would look so great over a colorful rainbow gradient, don't you? It does need to be applied with a dabbing method, but the consistency makes it easy to do that with just the brush (no need for a sponge). Shown here in two dabbed coats over It's a Siren, Not a Mermaid with top coat. Overall I'm in love with every single of one of these gorgeous shades. I love how personal the inspirations are to the maker, you can see the love she put into each and every one of these colors. I definitely had a hard time picking favorites among these, but my must-have picks are 1962 Worlds Fair and Smashed Guitars. But tell me guys, which one is your favorite? To recap, the Summer in Seattle Collection Part 1 by Daily Hues Lacquer is now available for purchase. Each full-size polish will retail between $8.50 to $10.50. The entire collection is also available to purchase for $51. Don't miss out because these are going super fast! Your swatches are always perfection! Your swatches are gorgeous! It's Pike, Not Pikes & 1962 Worlds Fair is going on my wishlist! These are all gorgeous, but I love Siren not a Mermaid the most! Such a beautiful collection, I loved how used the topper. These are stunning and I'm obsessing over that thermal!